Gas prices have surged an average 36% since the end of January, when prices hit their low point. 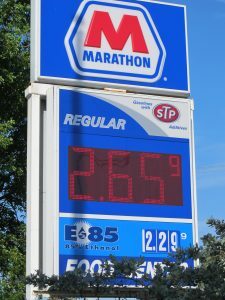 A spate of mid-spring gas price hikes, closely tied to a rebound in crude oil prices, has begun to slow with the onset of the summer driving season. Nonetheless, weeks of unrelenting price hikes have pushed the retail price of gasoline up about 30¢ per gallon since late April, according to data from the U.S. Energy Information Administration. The surge in retail prices has reclaimed price gains made in favor of consumers since the middle of summer 2014. The biggest price increases happened in a three week period from April 20 through May 4, when prices shot up 8 and 9 cents per week. By the middle of May, price increases were smaller, but remained persistent. It is unclear whether the pace of increases will continue to slow, which normally happens this time of year. While the recent price gains for retailers may seem to sting the consumer, the overall picture is actually quite good. Going into summer 2015, drivers around the U.S. are paying almost a dollar less for every gallon of gas they buy. From the Gulf Coast to the New England states, prices are down anywhere from 95¢ per gallon to over $1.00. However, drivers in California, hit hardest by recent price increases, are only realizing a year-on-year price break of about 50¢ per gallon. In all, the recent weekly price increases, which started in earnest in late April, are shown in the graphics below, highlighting weekly U.S. averages and regional high and low points. A synopsis of the week’s activity is summarized. The E.I.A. weekly price tables are also included. With the onset of the summer driving season, gas prices are 73¢ per gallon higher than when they hit their low spot on January 26. In the four months since, crude oil stabilized and global demand began to shrink. But refineries also switched to summer blended gasoline, which adds to seasonal price increases. Even so, the price differential from late January represents a 36% jump in retail gas prices. Put a different way, if the weekly price increases are averaged, prices have gone up 4.3¢ every week since February began. 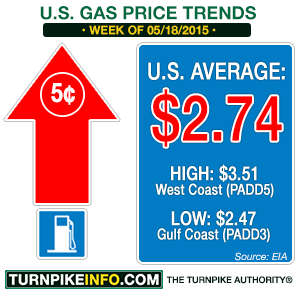 As the retail gas price reversal continues, prices have during the May 18, 2015 E.I.A. survey hit a figure most consumers had not seen since just after Thanksgiving the previous year. Price increases since April 20 had pushed consumer costs up 35¢ per gallon, erasing a significant portion of the gains drivers had enjoyed in the retail price arena. The bounce in prices in the May 18 report was offset by news the same day that crude oil supplies would remain high, a potential indicator of steady or even lower gas prices in the weeks ahead. Weeks of unsteady increases in crude oil prices had been adding to the retail price hikes, but the price at the pump did not increase as much the week of May 11, 2015. The weekly E.I.A. report showed the average price nationwide increased three cents per gallon, but that was less than half the rate of the previous three weeks. Nonetheless, the damage had been done. By the time of the May 11 report, consumer gas prices had jumped an average of 20¢ in less than a month. Crude oil prices have been rising on an unsteady course since the middle of March, pushing consumer gas prices higher. The weekly price report for May 4 showed the strongest weekly price hike since the February 9, 2015 report, when prices soared 12¢ week on week. The region hit hardest by the price gains was the West Coast, where a significant surge in California’s gas prices dragged the entire regional price index higher by 24¢ per gallon. That nearly matched the previous three weeks’ worth of increases in the national averages. With crude oil prices continuing to climb, consumers continued to pay the price at the pump the week of April 27. Prices jumped 8 cents for the second consecutive week, pushing the national average over the $2.50 threshold, and rapidly pushing the national average price closer to $2.60, a level not seen since December. Meanwhile, drivers on the West coast were hit hard with a 21¢ weekly price hike. Crude oil, which had been threatening to close over 60 dollars per barrel for the first time in months, would finally do so only three days later. It has been five weeks since the late-winter price surges that pushed gas prices from a national average low of $2.04 per gallon to $2.49 per gallon by March 9. However, prices had remained little changed since that time, going down only a few cents in the intervening weeks. The April 20 gas price survey showed prices were about to soar from week to week, but the gains would not be as severe as the double-digit weekly price hikes of early February.